Bay City, Mich. â€” Abnormally warm late-summer temperatures may have been a contributing factor in the deaths of approximately 200 ducks and geese in early September near Saginaw Bay, the DNR said. The waterfowl, which included both adult and juvenile mallards, green- and blue-winged teal, and Canada geese, died after becoming infected with Type C botulism, a lethal type of food poisoning often associated with periods of hot weather, high water temperatures, or low or changing water levels, said Adam Bump, a DNR wildlife biologist in Bay City. The birds were reported to the DNR by personnel at a Richland Township sewage treatment facility near Hemlock on Sept. 8. When the first cool nights of late summer and early fall hit, I think about many different things, like the goose hunting Iâ€™ll be doing, or where to place my favorite deer stand. But most of all I think about those small, beautiful screaming birds, the wood ducks. I absolutely love these magnificent birds. They are vocal, fast on the wing, and give me a rush that sends chills up my spine during those gloomy morning hours of early duck season. I prefer to hunt woodies by sitting by a river or a beaver pond in morning darkness and anticipating what could be in store that day. TRAVERSE CITY, Mich. - Prodded by a lawsuit, the U.S. Fish and Wildlife Service has agreed to designate critical habitat for the endangered Hine's emerald dragonfly. The federal agency reached a settlement with five environmental groups that accused the government of shirking its responsibility to protect the dragonfly, found only in a few Wisconsin and other Midwestern wetland areas. A federal district judge in Washington, D.C., signed an order last week to implement the agreement, said Brent Plater, attorney for the Center for Biological Diversity. CHEBOYGAN - The number of double-crested cormorants residing in a stand of trees along South Main Street has attracted the attention of the Cheboygan City Council. The Cheboygan Sportfishing Association will petition the Council at today's 7 p.m. meeting to send a letter to U.S. Sen. Debbie Stabenow, D-Michigan, to seek funding for control of the distinctively-winged birds. "There is possible funding available for control measures for these birds," City Manager Scott McNeil said Monday. "The process involves coating the eggs within the nesting areas, I believe." UNIONVILLE -- A steady parade of goose-less waterfowl hunters pulled their boats up to the ramp at Fish Point Lodge and hauled them from the water, bemoaning the fact that their sport is one of the few where the weather can be too nice. "You know you probably aren't going to do much when you're hunting geese in shorts and a T-shirt," said Alan Skunda of Flint, who hunted on Saginaw Bay with his son, Keith Skunda of Lapeer, and Michael Kale of Burton. 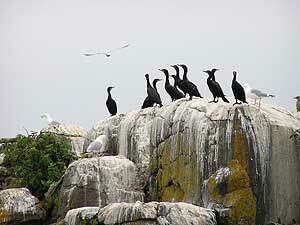 Cormorant are destroying the islands of Western Lake Erie and feasting on its bounty of fish, but no one seems willing to kill them in order to reverse the rapid population growth of the black birds on the limestone rock islands. Five endangered whooping cranes are still trying to find their way home after flying too far east of their destination. Sixteen whooping cranes left the Necedah National Wildlife Refuge on Oct. 16. Three of the birds returned from Michigan July 28, but the five others remain perplexed by Lake Michigan, which sits between them and their home. Only seven of the birds returned as expected this spring, after one was apparently killed by a coyote. Joan Garland, outreach coordinator at the International Crane Foundation, said the birds are part of a group of eight that flew too far east on their return trip from Florida. Peter McNicholl says he doesn't doubt the bald eagle is less of an endangered bird these days. McNicholl, who lives on North Dease Lake in Ogemaw County, said he was even endangered himself by a bald eagle while flying a small airplane. "I came within probably 25, 30 feet of having a collision with one. It was pretty much head-on," said McNicholl, 70, adding that the bird had a wingspan of about 7 feet. "And it was just a small little airplane. A collision with an eagle like that would probably put the plane down. That was kind of a scary moment for me." So can we expect Eagle hunting season to open soon? I hear they taste like chicken! Duluth, Minn. â€” Don Carlson and Nancy Drilling circle around Knife Island in Lake Superior and choose a place to land. "Nancy, if you want to start the count right here, I'll walk through the brush down the center and through the backside," Carlson says. "And I should meet you right over there, at the end of the island." Carlson hooks the anchor on a rock on the shore. WEST MICHIGAN -- Two decades ago, the only certain place to find a bald eagle in West Michigan was on the back of the $1 bill. Today, as the effect of now-banned pesticides and industrial chemicals subside, the majestic bird is growing in numbers along the area's river corridors and forests. "When you saw an eagle 20 or 30 years ago, it was a pretty big event," Department of Natural Resources wildlife biologist Nik Kalejs said. "Now, it's still exciting, but not as rare. And that's nothing but good."